First, choose a recipe below by clicking on the photo. 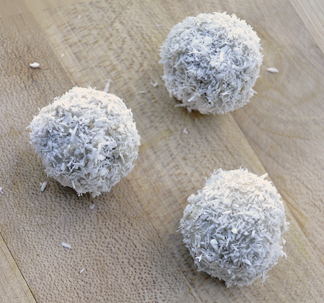 Once ingredients are combined, roll balls into shredded coconut until covered, giving them a mostly white coating. Using a knife, cut circular shapes out of organic fruit leather. In the photo below, a straw was used to punch out the center hole, creating an "eyeball". 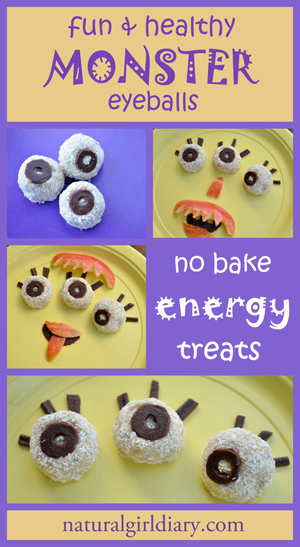 Gently push the fruit leather eyeball onto each ball. Cut various additional shapes out of fruit leather for eyelashes. Cut apples into shapes to give kids another creative element. 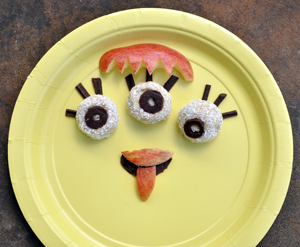 Encourage them to play with their food and create a funny face, then eat what is on the plate for a nutritious treat.